The market has reason to believe that the Fed is going to stop raising interest rates for a while. 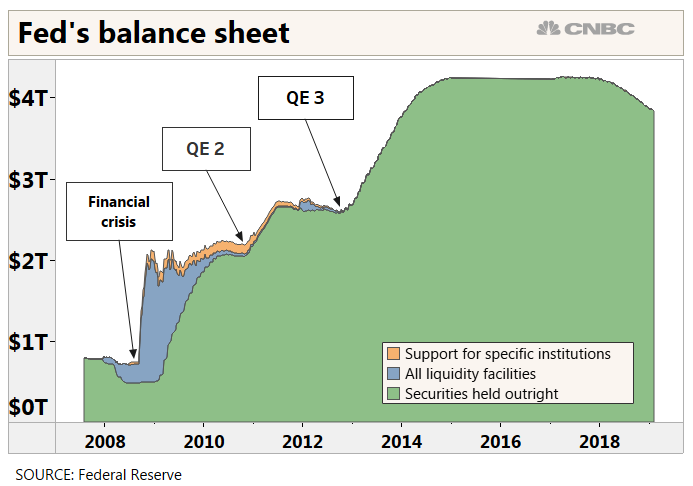 Less certain is what the central bank will do with the $4 trillion of bonds left on its balance sheet. That latter issue is likely to take focus Wednesday when the Federal Open Market Committee releases notes from its January meeting. At that meeting, Chairman Jerome Powell and his fellow committee members made it clear that they would be “patient” with rate hikes and that for now policy tightening will be on pause. However, while Powell indicated he would be watching how the process unfolds, there were no indications the roll-off would slow. The Fed currently allows up to $50 billion a month in proceeds from Treasurys and mortgage-backed securities, though it does not regularly hit that number. Since the process began the bond portfolio has shrunk by more than $400 billion. The balance sheet had once stood at $4.5 trillion, the product of three rounds of bond buying — quantitative easing — the Fed instituted to lower long-term rates and pull the economy out of the financial crisis. Market participants are now wondering how much further the Fed will go. The minutes from the meeting, which helped spark a stock market rally, will be looked at closely. Several Fed officials have pointed to the end of the year as a likely point for the process to end, but even that remains in flux. The key in the discussions thus far is the level of reserves at which the banking industry feels comfortable. The decline in the balance sheet corresponds with a lower level of reserves. Currently, banks are holding about $1.64 trillion in reserves, or nearly $1.5 trillion above the required level. Many Fed watchers think the final level will be somewhere just in excess of $1 trillion, though some see it higher. “Once we reach $1.1 [trillion] of reserves, the normalization is done,” wrote Jabaz Mathai, head of U.S. rates strategy at Citigroup. Markets have expressed concern that the balance sheet rundown is working in tandem with rate hikes to tighten financial conditions. While Fed officials have insisted that the roll-off will happen with minimal market disruptions, the feeling on Wall Street is otherwise. Indeed, the market sees no additional rate hikes ahead as the Fed’s benchmark rate sits in a range between 2.25 percent and 2.5 percent. Traders actually are assigning a small chance — about 10 percent — to a rate cut by December. Another related issue that could come up in the minutes is how Fed officials convey their intentions to the public. Markets have recovered mostly from those issues, but Fed officials have been discussing how to improve communications, particularly if another crisis hits. Bill English, a 20-year Fed veteran and current professor at the Yale School of Management, said officials have some other options available to them to give the public a more reliable road map for future intentions. Among them are a “fan chart” for the possible directions of the fed funds rate, and information about the way policy could respond to changing economic conditions. The fan chart would be similar to one the committee uses to know display the level of uncertainty around interest rate projections. The intent is to keep investors aware of how much difference there is in various forecasts and reinforce that the rate estimates are not carved in stone. English said the current discussions around future policy responses could end up with a friendlier view toward negative nominal interest rates, as a recent Fed paper discussed, and quicker action to institute programs like QE.